PDF, Mobi, AZW, Text, KFX. 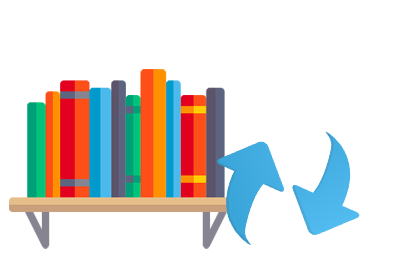 Any eBook Converter is a powerful and professional eBook Converter to remove DRM from eBooks files, including Kindle eBooks, Adobe eBooks, Barnes Noble NOOK eBooks and Kobo eBooks. 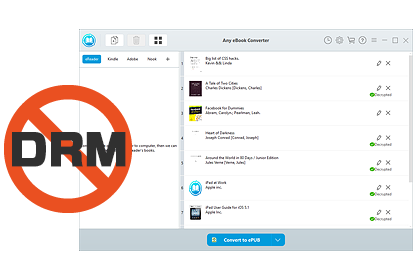 After removing DRM, you can read your purchases on any of your e-readers or apps that you want. Currently, Any eBook Converter supports adding up to 24 file format for converting, such as Kindle, Adobe, PRC, HTMLZ, DOCX, etc. 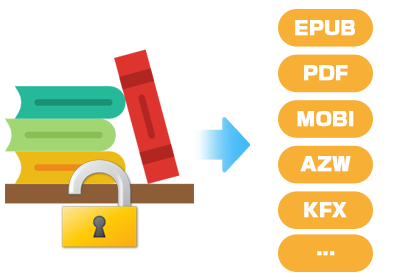 Thanks to the top-leading DRM decrypting technique, Any eBook Converter is capable of converting most of eBooks files to DRM-free ePub, PDF, Mobi, AZW, Text, and KFX format with only 4 steps. Besides that, It provides the user-friendly interface and functions, allowing the software to automatically scan the entire eBook library, then you can use one-click to import all the eBooks. Any eBook Converter is a shareware, allowing users to download the trial version for evaluation before buying it. 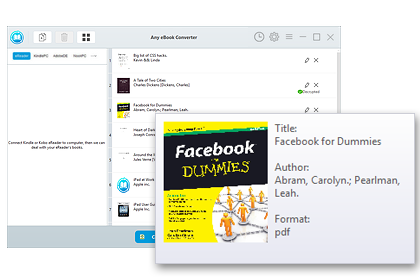 Once purchasing the full version, you'll get a license to unlock the trial limitation, enjoy free updates and technical support of this greatest eBook converter. It is one-time fee! Why Choose Any eBook Converter? This really was the “ultimate eBook converter” tool for my purposes. Not only was the program simple and user-friendly, it also offers free online technical support. If you are hesitating in getting this, don’t delay anymore! Lifetime free updates and support.